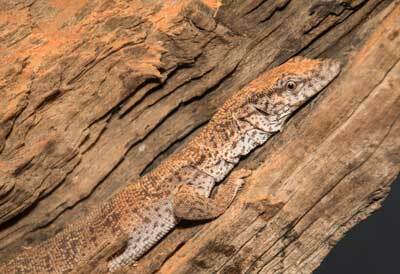 The pygmy mulga monitor (Varanus gilleni) is a small monitor well adapted to arid areas, are usually associated with mulga, gum and desert oak trees, sheltering in hollow branches and under bark rarely seen on the ground. Round tail in cross-section bearing keeled scales, nearly one-and-a-half times the length of its head and body. The monitor has a grey-brown back, which fades into light grey at the sides with a series of narrow, irregular reddish-brown spots and short bars. Its underbelly and throat is white with grey flecks. As with most monitor species patterns are more conspicuous in juveniles and will gradually fade as the animal ages. Pygmy mulga monitors are arboreal, with prehensile tails. They eat insects, lizards, small mammals, and eggs. They grow to around 35cm in total length, 10cm of which is tail. The upper surface is brown, grading to grey at the sides. The nostrils are positioned slightly to one side of the muzzle. They weigh, on average, 60 to 80g. Monitors in some areas are threatened by habitat loss. Larger monitors and birds of prey eat pygmy mulga monitors. Monitor lizards are thought to be venomous. While harmless to humans, the toxin is lethal to small animals.